Cape Kiwanda has seen a surge in tourism over the past 10 years, particularly during peak summer months, increasing pressure on Cape Kiwanda’s transportation facilities, infrastructure and environment. 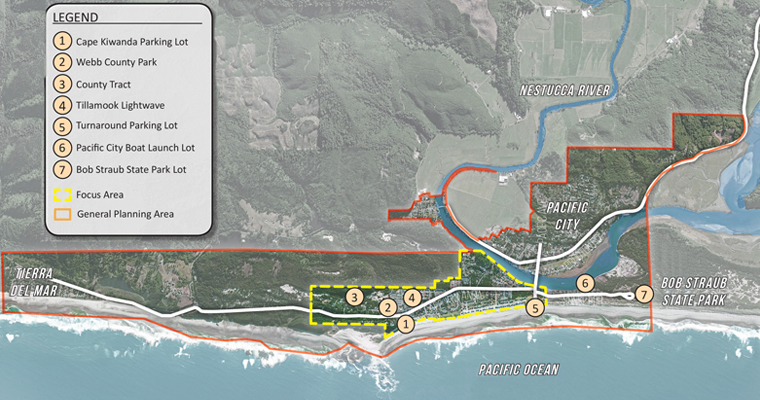 This plan creates guidelines to improve, locate, and develop tourism-related facilities and infrastructure on a series of public lands adjoining the core beachfront in Pacific City, OR. The Cape Kiwanda Master Plan for Tourism Related Facilities was developed through a year-long community process led by 3J. The goal of the Master Plan is to provide a sustainable blueprint to improve, locate and develop tourism facilities and infrastructure within the Cape Kiwanda Focus Area. The framework intends to protect beauty and natural resources; minimize and mitigate the adverse effects of visitors; improve the visitor experience; and accommodate new visitors. The plan creates guidelines for improvements on a series of public lands adjoining the core beach front in Pacific City, OR. The team collaborated with over a dozen county, state and federal agencies, including Tillamook County Parks Department and Oregon Parks and Recreation Department. 3J planned and facilitated six meetings of the Project Partners, two meetings of a Citizen Advisory Committee and three community-wide meetings. The public information sessions helped the team craft recommendations for improvements to existing infrastructure and create new tourism-related facilities. A prioritized, phased implementation schedule. 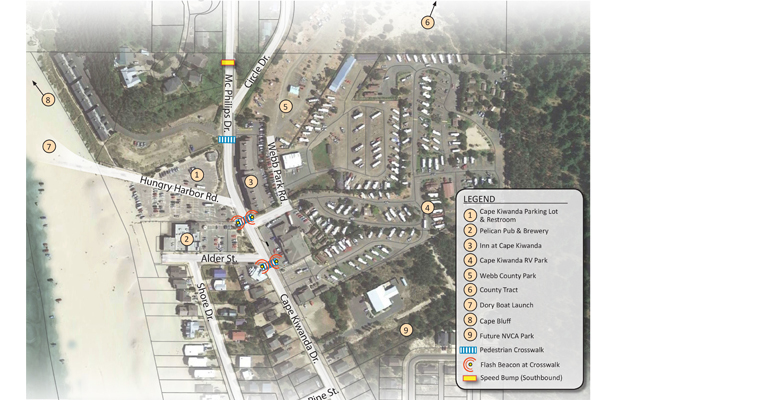 Immediate and long-term recommendations include facility upgrades and better parking management to the Cape Kiwanda and turnaround parking lots, roadway and streetscape improvements along Cape Kiwanda Drive, a visitor parking shuttle, and development of a new, larger Webb Park campground. Many of the elements the Master Plan addresses are clustered in the area near the Cape Kiwanda parking lot, but the general planning area is quite expansive, reaching north to the residential community of Tierra del Mar from the Pacific City-Woods area in the south. The primary improvements in the first phase of the plan's implementation involve pedestrian safety enhancements and visitor support spaces, including signalized crosswalks and restrooms.